Aaron Sinift (b. ’66) is an artist living and working in Beacon, NY. He has a BFA in painting from the University of Iowa (96′) and an MFA from Boston University. He instigated the 5 Year Plan Project 5 Year Plan.org to engage with Gandhi ashram khadi collectives to deepen his understanding of life in India from the perspective of Gandhian service, which he has found to be life changing. He lives with his wife Greta Byrum and 4 year old son Orion. “Weaving Stories: Artists in collaboration with Gandhi Ashrams”is to be published as an article in a forthcoming book Freedom of the Presses: Artists’ Book in the 21st. Century. It is a personal reflection. It explores how the idea of a 5 Year Plan book was conceptualised and how Gandhian ethics and economics underpin the project. It then goes on to present the evolution of the first two books, 5 Year Plan and Other Imaginings. The article is published here as a 5 part series. In the present cultural moment there is deep anxiety as to what can be known as objective factual. In the digital world, lies are generated by design and instantaneously broadcast throughout the world the world via targeting algorithms. It is the challenge of this moment to clarify what is truthful and preserve what are facts. Any digital information can be deleted from existence (or distorted) in key strokes from anywhere. Librarians and library collections have become indispensable in the material preservation and continuity of thought. 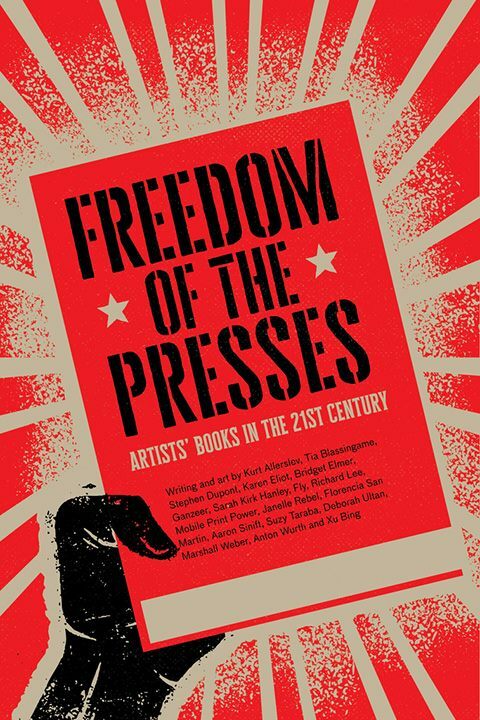 As an artist who makes books, I feel it is incumbent upon me to create a work of art which preserves aspects of Truth, which materially embodies the Truth, which cannot be done digitally, and which engages the world directly as an international social architecture of participants, including the reader. Since 1990 I have felt longing for a world I experienced fleetingly, almost 30 years ago in India, in a socialist economy in twilight, imperfect and moribund but refreshingly free of American style consumer culture. What impressed itself upon my mind most clearly were the temporal qualities of art and life, and how integral art is the fibre of the local community, how it supported by the local community. Season after season for hundreds of years, enormous effort and creative energy is focused upon art forms which may only for single festival night (mud) or forever (stone). Though these artists take pride in their work, they do not sign their names, and I found that the western understanding of “Art” and the artists prerogative of self-expression did not apply to their self-perception. The 5 Year Plan Project began from a desire to examine this sense of community based art by engaging with Gandhi’s living legacy in India through its ashrams. The project evolved into a seva (service) in honour of Gandhiji and as a challenge to the accepted logic of neo-liberal capitalism in general. Returning home, to college, I used a homespun cloth Gandhi Ashram jhola (sling bag) to carry books and whatever else I needed. The jhola bag had folk images on both side panels, one of national unity under the Indian flag, and the other a trio portrait of Indira Gandhi, Nehru, and Mahatma Gandhi, delightfully printed in three colours. 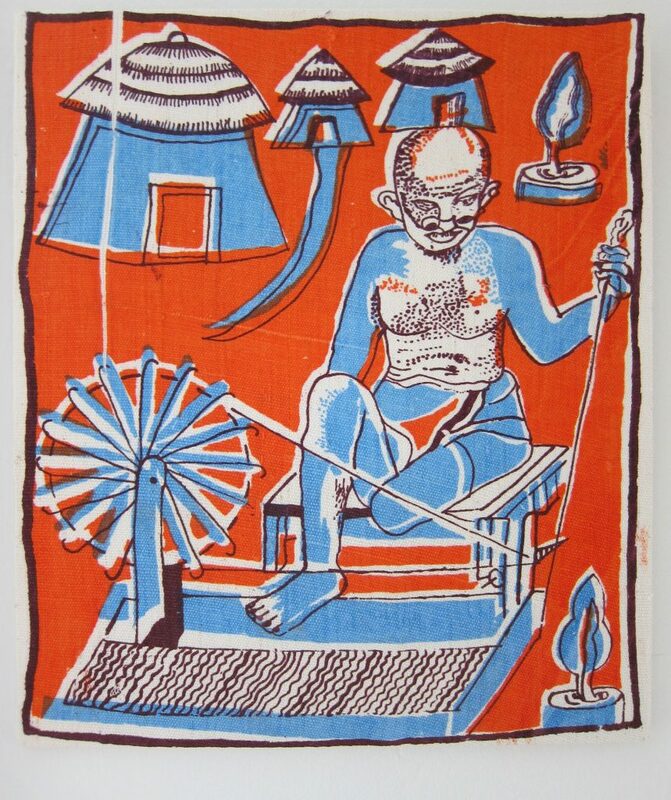 Over the years I began to wonder about the artist who had done the drawings and reflected upon their anonymity, and recognized that the artworks were their seva (service) to the Gandhi ashram and its ideals. I also began to notice that the homespun fabric, called khadi, seemed to get softer and more pleasant the more I used it. I wondered where it came from and what kind of society made it. I remembered the travelling in rural India and watching women thrashing grain against a rock to separate the rice from the stalks. They were only 20 feet away and yet it felt to me as though we were separated by hundreds of years, and I felt the out of body sensation of knowing that their existence on Earth was truer to the common baseline of humanity than my own detached modern experience. I reflected that our minds are wired differently now, we simply live in a different reality. I had a dream of making a book out of jhola panels, a collection of Gandhi ashram artworks, and I applied for grants and scholarships to make it, but my pitch was too artsy for academic funding, and too academic for art funding. Eventually at home washing dishes, an idea came to me that was so asymmetrical and counter-intuitive that I began to dream of a solution that seemed to incorporate all the elements that drew me to the obsession in the first place. it had to be Art. it had to be as constant as possible with Gandhian ethics. An experiment in Gandhian economics. it had to be independent and non-affiliated. DIY. No corporate sponsorship. it had to be “authorless” and by community subscription. it had to involve people and be of service to them, using what they do naturally, and making use of their abundant resources. Artists are prolific and their nature is generous and compassionate. 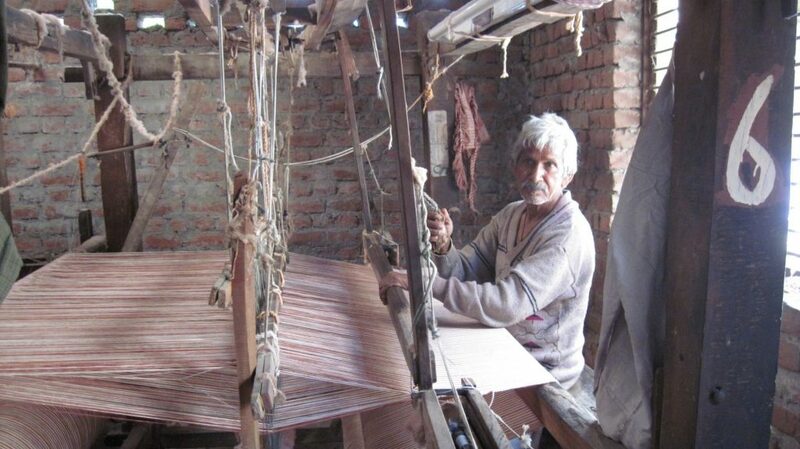 Gandhi ashram spin and weave khadi cloth. To gain subscriber support, it had to reject all altruism and create real value for them. To respect human dignity it had to reject any pretence of charity. To respect all participants, capital must not accumulate with one recipient. Half the artwork had to come from South Asian artists. Half the artists had to be women. No more than 4 famous artists out of 30 total, treat all the same. -If we consider “art” and “money” as energies (shakti or chi) that are activated by human “desire”, than these energies can be aligned to flow in a virtuous cycle of mutual service, therefore capital must be recirculated back into service in order to maintain the cycle. This would ideally have the effect of creating a community of interlocking abundances that would serve each other’s needs. -To my knowledge, the best record of of service in international crisis relief is with Doctors Without Borders (MSF). -Could artists contribute their work to a collaboration with Gandhi ashrams in India to create a khadi cloth book to be sold to benefit Doctors Without Borders? Drying the dishes it occurred to me how risky this project could be. Once started, failure to follow through would damage my reputation; if I created kitsch it would become an embarrassment, the world having enough crap in it already; and if I lost or misused the subscriptions it would be dishonorable or fraudulent; and if it were ethically inconsistent, I ran the risk of dishonoring Gandhi’s legacy and all those who serve it. The possibilities for public humiliation have never been greater, and I spent months researching and thinking the plans through, and then months discussing the ethical implications wife and various friends (which I still do). I had lost my art gallery job due to the market crash of 2008 and was living in NYC on unemployment and with only $0.01 in my savings account. To do this required careful planning and serious commitment, and I had never been to a Gandhi ashram before and didn’t know anyone who had. With all this in mind I decide to call the project “5 Year Plan” for two reasons: 1.) I knew most businesses make no profit for the first 5 years; 2.) I could quit after 5 years.